Are you interested in serving your community? Are you willing to join like-minded individuals in accomplishing great things that you couldn't on your own? Check us out. You'll feel right at home. But it isn't all hard work. We like to have fun too. We like to relax and have a good time. Come join us at our dinners. See the Lions at play! How does one become a Lion? 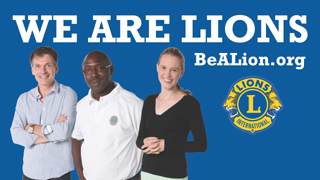 To become a Lion, you must be of legal majority, good moral character and good reputation in your community. Contact the club and express your interest. Look at the calendar to see when the next meeting is. Attend a meeting to learn more about the club and its service projects. If you feel comfortable and like what you see at the meeting, ask about becoming a member. You will be assigned a sponsor that will guide you through the ropes. Call the number at the top of the page or fill out the form on our contact page and get started on a truly rewarding journey. Many people ask, "What is the cost?" We pride ourselves on being one of the most economical clubs in the area, focusing on raising funds from the community, not from our membership. Coming soon! Ask about our corporate rates! Make your company a part of the premier service organization in the community! Call Today! Become a part of the team. The winning team. The Payson Lions. Call the number at the top of the page or send us a email from our contact page!